I try to stay calm! This item is triggered by something that happened today. I’ve been told that I’m too sensitive, hypersensitive, in fact. I notice slights, insults, ill mannered actions, bad manners, tactless remarks and so on. Nineteen times out of twenty I say nothing, let it slide, keep my happy face on. But I rarely forget. Nine out of ten people will never know I’m upset. But I notice the insults and stupidities. Today I’ve been assembling my LARGE order for my model railway parts. About midday I phoned a company called DCC Concepts who are quite big in model trains, both manufacturing and in sales. Amazingly, they’re in Naval Base, about an hour down the road from here. Yay, a WA company. I spent some time on their web site. But I couldn’t find anything for N-gauge (2mm:1ft) on their site. So I phoned and asked. “No mate, we find N-gauge is too hard on our eyes.” That is, they don’t like it because it’s too small. Well, I take this to mean that if you want N-gauge, you must be (a) weird, (b) a toy railway maker, or (c) not worth their time or attention. I was offended! This is what I mean about Australian retailers. It’s near impossible to deal with Australian firms. Stanbridges have been the pre-eminent model train place in Perth for decades, but their web site is useless. No pictures, no idea of stock levels, many missing prices. Don’t waste my time, please. So, the result was that I placed an $850 order with a UK retailer today. Stupid, stupid, stupid. They lost my business. It’s cheaper and easier to order from the UK than it is to drive down the road in Perth. This is the time to bring up another incident that happened many months ago. A visitor needed to use the toilet while he was here and before I could direct him to the second bathroom toilet, he walked in to my en-suite bathroom and used the toilet there. No problem for me, so far. But when he came out, he made a comment (I can’t remember the exact words) that it needed cleaning and asked if I’ve considered getting a cleaning lady. What!! How bloody rude! I would NEVER make a comment on the cleanliness of someone’s bathroom or toilet. I was offended. And this same guy about half an hour earlier had told me I’m too sensitive. Yeah, right. On another occasion several years ago, with a friend who’s a bit of a wine buff, who demonstrates wine and likes to buy good stuff, I offered to share my bottle of 1971 Grange, a $1,000 touch by now. I suggested we make it worthwhile by going to a really good restaurant, Clarke’s of North Beach, a highly rated local restaurant. Well mate, that cut you out of that wine tasting. I’m not going to be told who I share my wine with! Non-negotiable?! On another occasion, when I was preparing to move to Bali, a friend said, “You’d better learn to control your temper in a Muslim country.” Oh how tactful. It’s not a Muslim country, mate. Get your facts right and learn a bit of tact and politeness. I’m not the one who needs to learn how to behave in a foreign country. He’s never been to Bali, by the way, knows nothing about it, yet he wanted to give me gratuitous advice..
On another occasion, I asked if I could borrow a friend’s digital camera because I waas thinking of buying that model and wanted a feel of it. He said, “Oh, we’ve made it a policy not to lend cameras because of damage that’s happened in the past. I hope you won’t be offended.” Of course I was offended! He was suggesting I would damage his camera. I was bloody offended and upset. We got through it, but he still never lent me the camera. These are just four examples of the hundreds of insults and ill mannered comments I have to endure. For 95% of the time, I endure it with a smile and don’t let my feelings show. But eventually, occasionally, things build up and I blow my stack. It happens rarely! No more than three or four times in the past 15 years. But because of my final angry outbursts, I’m seen as too hard to get along with. Well, I can’t see any way past this. I don’t know any other way. I try my hardest to put up with it, but some people just break through my politeness. As I said, I placed an $850 order with Hatton’s of the UK today. The VAT was GBP44, which comes off the total, and the freight to my door is GBP34, so I pay 10 pounds less than someone in the UK pays! Delivery is 2-3 working days after completion of order, they say, so next week. This is pretty amazing stuff. Here am I sitting in my room talking to computers in the UK at about 4am their time, able to browse their entire catalogue of thousands of items, all with pictures, prices, measurements, stock levels and weights. I make my order, pay for it by credit card on line, get a one-off Netcode security SMS number from the Commonwealth Bank in Sydney on my mobile phone, enter my address with only a few clicks because the web site knows all about Butler WA, click accept and get a confirmatory email withing seconds. All done. Bloody amazing. Electronics does this, ladies and gentlemen. Electronic engineers and technicians. Let’s hear it for them! I bought two more blow-mould tables today, to support my baseboards. These are 1200 x 2400mm tables that fold up in the middle like a sandwich, so they’re quite small to carry and store away. $38 each. I’ve got four now, so that’s all I need. Maybe one more, I’ll see. Tomorrow another sheet of 9mm MDF, but it’s too hot to go out! We’ve had a week of 37s and 38s, only 33 today but another 38 forecast for tomorrow. It’s too hot to go out for me. I also had a guy in to completely clean out and re-grout my main (en-suite) shower recess today. It looks a bit grotty at the moment because it’s covered in dusty dry residue that I have to leave for another 24 hours before I ket it get wet, but he’s sprayed all the tiling with a sealant, so I hope no more mould. Not that there was much, but the previous owners had tried to reseal it with liquid gunk and it looked terrible. I hope the natural look of the stone tile feature strip will show through now. Hey, close female relative of mine. Here’s your chance to find yourself a new husband. You and Tony Abbott would make a great couple. You both believe you don’t need to ask anyone or talk to anyone before taking action. Tony awards knighthoods, you throw bombs. You’re both supremely arrogant. You’re both ultra-conservative. You both deny the truth. You’re a man hater, he’s a woman hater. You’d complement each other. Great match. I made the first steps to starting to build the model railway yesterday. I bought two “blow mould” folding tables to rest the baseboards on, and a 2400mm x 1200mm sheet of 9mm thick MDF, plus some dressed pine to be the stiffeners. The large sheet of MDF was far too big and heavy for me to handle and I was thinking of buying smaller sheets to join up, at a substantially greater cost, but the guy at Bunnings said, “Save money, I can cut it [the big sheet] for you.” So he cut it into three 1200mm x 800mm sheets in no time flat, about 5 minutes. Cost – $24.75 versus about $36 for three separate sheets. No charge for the cutting. I didn’t see him do it but he must have a large table saw there. Brilliant. I’ve started to realise just how big this layout will be. Baseboards 2.4m long are big enough, but I plan to have two of them joined end to end, totalling 4.8m! Add 1.2m where they form the L shape and the length grows to 6m. That’s big. In my lounge room! I do have the space, but it’s going to be hard to handle. I’ll be making the baseboards in 1200mm x 1200mm sections bolted together so that it can be moved out, if I have to. I need to do some precision cutting and I think this finally justifies buying one of those small diameter hand power saws, even a battery operated one. I’ve been admiring them for several years but (showing great restraint! ), couldn’t justify it. Now I can. Time now to start ordering some track and rolling stock. 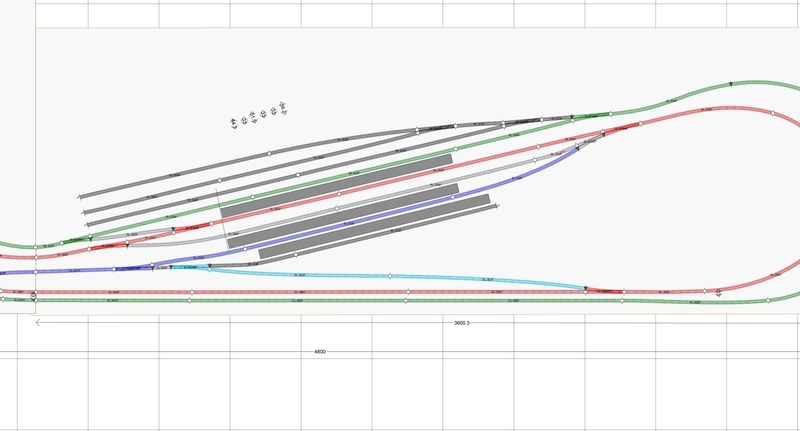 About $330 for 63m of flexible track, plus 23 sets of points at avg. GBP9.75 ea = $345. That’s $675 for track alone. Add a loco at about $150 and a controller at about $600 and we’re talking serious beer money. Oh well, I’d just waste it on books and CDs otherwise. I’ve seriously tried to find a good source of these components locally in Perth or within Australia, and I’ve given up. There’s one source called DCC Concepts in Naval Base WA, of all places, and they even manufacture and export items. But they don’t cater much for N gauge and they are seriously more expensive than ordering on the internet from the UK. The traditional place is Stanbridge’s in Mt Lawley, been there for decades, but their web site is useless and I’m not going to just drive there only to find they have no stock or don’t stock things. Australian model railway retailers are bloody hopeless. Complete amateurs. It’s far easier to order from a big UK retailer who will send stuff here with no problems. One good thing is also that we overseas customers don’t have to pay the UK’s VAT, so that’s 20% off their advertised prices. Nice. That more than pays for the freight. A couple of days’ progress. I must say I’m finding this design process almost as much fun as actually building it, which I haven’t got anywhere near starting yet. I start each day as a new copy of the drawing so that I can go back if I mess it up, and I can make changes to my heart’s content. Another view showing how I’ve copied and modified the magazine article. The red and green lines at bottom left will be at a higher level than the red and blue at baseboard level. I must admit this plan is ad hoc. I’m not sure of the operations, I’m just making it up as I go along. 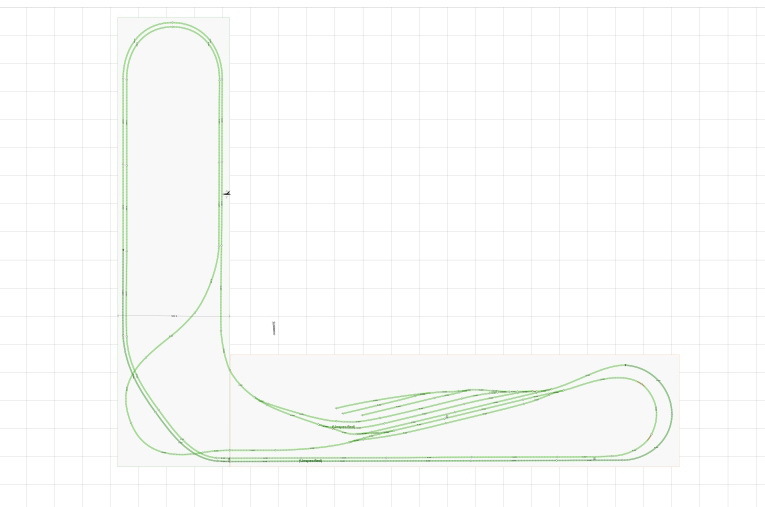 My priority is to have wide smooth curves and long stretches like real railways. Carriages going around tight curves and sticking out as a result are not realistic. I think I’ll hide the half circle curves in tunnels or cuttings. I’ll have to measure up some trains and carriages and place them in the drawing to try to judge the scale. I have no idea if it’ll be realistic at the moment. I intend to print this plan out at full size, i.e. baseboards 1.2m wide x 4.8m high in the vertical, and 5.0m wide on the horizontal leg. That’s HUGE. Then I’ll lightly paste the printout to the craftwood base sheets and use the drawing to lay tracks. I did a trial print this morning and it uses 96 sheets of A3+ !! No, I didn’t use actual paper – I print to PDF and I can see each A3+ sheet on the screen. I could print just a few sheets to do a trial. I’ll be using the cheapest paper I can find, of course, when I do the actual printing, as the paper will be torn away after the track is laid. Hmmm, photocopier paper only comes in A3, so that means smaller pages and more of them. Another trial print coming up. Another checkout error at IGA yesterday. I watched the screen as closely as I could while the guy was scanning my items and nearly, nearly, walked out without checking the docket. But I did stop to check, and my kilo of peaches at $3.99/Kg had been rung up as nectarines at $6.99/Kg. Grrrrr! I immediately went back to the checkout aisle but the guy, the boy, made me wait while every other customer went through. I said, “I’m going to start shouting for the manager if you don’t pay me attention soon. YOU have made a mistake.” He still asked me to wait, then called a more senior woman over. It still took more than 3 mins for her to sort things out but at least she refunded the whole cost of the item. I’m going to have to write them a letter of complaint. I literally cannot get through that shop without there being an error of some kind, and it’s always in their favour! My advice is to always take your docket and always check it, in any shop. There are so many scanning and pricing errors, and it’s always against you and me. I needed a new car battery last Tuesday, and the RAC were here within 20 mins, and it was all done 10 minutes later. EFTPOS payment by wireless. Amazing. The old battery had lasted since around July 2009, so pretty good. The new battery is the same brand and has a three year warranty! Then on Friday I called a pergola man about fixing a loose Alsynite sheet on my patio that was banging in the wind. He was here within 90 mins and job done in 15 mins. $70 cash. Fast work. I’ve got a grouting man coming this Thursday for my bedroom 1 shower, which is looking very mouldy and grotty. The previous owners have attempted a reseal, but it’s a very poor, unsightly job. He doesn’t need to look, he says, it’s a flat fee of $400 no matter what, and he replaces ALL the grouting, even if it looks OK.
Fast service these days, in other words. And as I write, on Sunday of the Australia Day long weekend, the builders are still working on the new townhouses across the roundabout from me. All the shops are open on Sunday these days, as well. Amazing. Times have changed. My Solid State Drive (SSD) failed last October and I’ve just got around to finding out how to claim on warranty for it. I found OCZ’s web site and submitted a request. They asked me to do a test but it did no good, so the next step is that they’ve given me an RMA number, a Return Materials Authorisation. But I have to send it at my own expense via DHL, or one of those shipping firms, to Taiwan! They’ve asked me to do a survey, so I’ve told them I think I should be able to return it to the place I bought it (Osborne Park) for replacement, or at least, only have to send it to an address in Australia. Not happy about this. I’ve mentioned before about being a fan of the Chinese TV show If You Are the One on SBS2 at 7.30pm every night. It’s 24 girls, women, looking for a husband, and guys are wheeled out one by one as love candidates. But I’m also very unimpressed at how easily many guys are rejected by the women, often for trivial reasons. One woman in particular is 29, overweight (chubby, as they call it) and has an eight year old son from a previous marriage. She’s not ideal, in other words, but she has a bubbly personality and says many times that she’s looking for an older guy, but almost any guy who can accept her will do. She gets very excited sometimes but is usually rejected as too old and because she has the son. So a couple of nights ago, there was a 32 year old guy who not only chose her as his favourite, the first time I can recall that happening, but explicitly said he could accept a child as his own. He seemed like a really good guy. Perfect match. So what happens? She rejected him! Why? Because he’s a reformed drinker and doesn’t drink any more. She wants a partner who she can drink with. Bloody hell. He was crestfallen and she was upset when she realised what she’d done, but it made me wonder if she really knows what she wants. She’s still on offer in the lineup, but I hope this one-in-a-million guy gets a chance to try again behind the scenes. This was a big chance for both of them. Another very cute and bubbly regular girl seemed to take an instant liking to a guy who was a childcare worker, as she is. She even came out on the catwalk and made a balloon toy with him – something like that never happens. She kept her light on to the end, but when it came to the crunch, she rejected him! Why? Because he was one year younger than her! What the hell … ? I think many of these women either don’t know what they want or are too afraid to commit. I feel very sorry for many of the guys. It’s very hard on them. I’m also rapidly losing sympathy for many of the women. They too easily reject guys for all the wrong reasons. A good female candidate is quite rare. I must say that this program, and my recent visit, have changed my view of China. The cities are quite attractive and the standard of living seems pretty high. There’s a huge emphasis on higher education. Most of the women are either PhDs or have Masters degrees, or are in senior positions, and many of the guys have completed a uni degree of some kind. China comes across in a very good light. As usual, individual people are nice. It’s just the power elite who spoil a country. “chubbiness” is no handicap. Quite the opposite, thin guys are criticised for it and asked if they can put on some weight. each guy has to choose his favourite girl right at the start, and I’m amazed how often the plainest, quietest girls are picked. The bright, bubbly, glamourous ones are not chosen as favourites. Hmmm. parental approval is extremely important, and the idea of living with parents is often canvassed. Some will, some won’t. double eyelids! The girls want eyelids with folds like we Westerners have, not the blank grooveless eyelids of Chinese. Crazy! How stupidly trivial. many of the girls think it’s OK to spend all their money on makeup, clothes, handbags and shoes. One, last night, even went so far as to say it’s women’s right, because they work harder than men. She is a sour looking woman and was sort of howled down. Served her right. 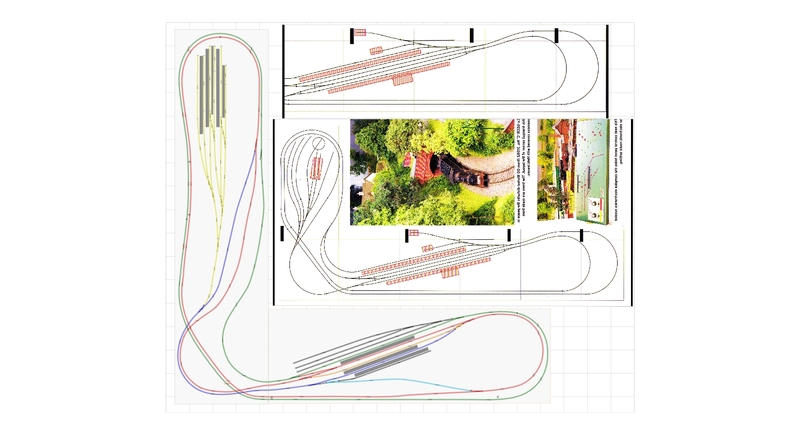 A few days’ work on the model railway plan. I realised I need to compress the horizontal (East – West) arm as it was 6m wide! I coud fit it, but it would dominate the width of my lounge. I’ve cut 1m out of it without losing anything. So now I have a through main line (red) and a branch line (blue) going through the lower station complex, which I’ll call Sydney for the moment. The yellow lines are a terminus station which I’ll call Perth. I’ll choose more imaginative names later. The next step is to work out sensible routes so that I have meaningful operations. There’s no point just having a train chasing its tail around one route all day. That will almost certainly mean more changes. This is good stuff. It’s taken a week to get this far and I’m nowhere near finished. It keeps me off the streets. Wow! Last year I got a flyer through the mail from iiNet offering fibre optic internet. But when I checked the government’s NBN installation plan, it shows this area as not connected and no date for when it will be. Disappointed, I didn’t take it any further. I have ADSL at 1.3Mb/s but I can’t get ADSL2+. Still, after all those years at Trigg with wireless broadband at not much more than dialup speed (56Kb/s ! ), my present connection is not bad. But this morning I got another email from iiNet asking me to sign up for fibre. Huh? So I had a chat with them and it turns out that this whole Butler Brighton Estate is fibre connected, via a private company called Opticomm Fibre. It must have been done ten years ago when the whole area was established. So it appears I can have fibre after all, 25Mb/s with a 200GB per month plan for $64.95/month. Bloody hell, I wish I’d known this in April 2013 when I moved in. Maybe now I’ll be able to watch video clips without them jerking and stopping. As well, I saw a friend’s new Sony TV last week. It’s a latest model 4K (4x Full High Def, i.e. 3840 x 2160 pixels). I wasn’t really interested in this before, as there’s no material available for it. But when I saw it I just about fell over backwards at the quality. Then when saw the internet TV services available on it, I changed my ideas. If I had fibre, so as to be able to access these on-line channels, that changes everything. The new US distribution channel Netflix starts up in March, and they do offer 4K material. Hmmm. So firstly, I’m going to sign up for fibre asap. I’ll think about a new TV later. Price? For a Sony 50″ 4K internet TV, $1795 approx. Another thing I’m thinking of – I’m driven mad by paper clutter. I have piles of articles, magazine pages, bills, receipts, notes, etc etc. I have four filing boxes full of documents. Fuji Xerox makes a device called the ScanSnap iX500. This is a double sided top feed paper scanner which scans both sides of a sheet in one pass and saves it to an editable PDF file. Hmmm. I do wonder if I need all these papers, but I prune regularly and I’ve still got piles left that I feel I need to keep. The scanner costs $519 plus freight. I could drive it from the laptop next to my table, so that it’s always right there at my elbow. Hmmm. Amazing stuff these days. In planning this model railway, I want platforms and buildings at N-scale 1:178 or 2mm = 1ft. A UK company called ScaleScenes sells extremely detailed designs in a web site at this scale or other scales. You just choose your design on the web, pay on-line for it by PayPal, then within seconds you have an emailed link to download your detailed PDF file. 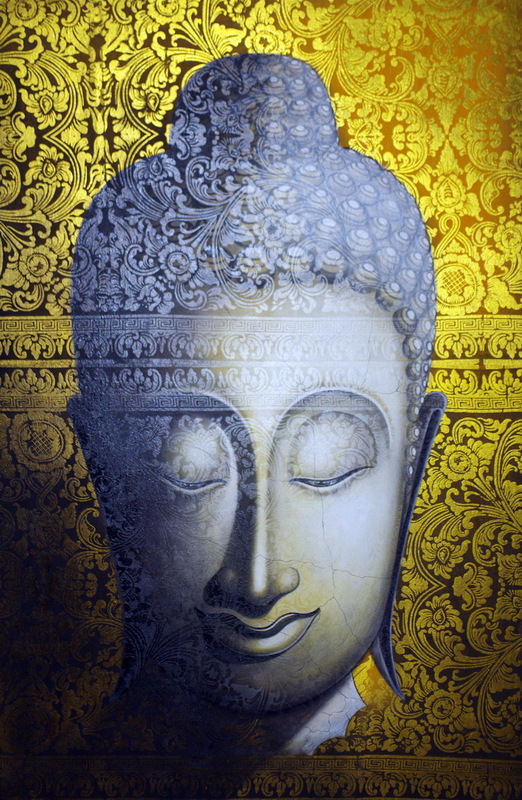 You print this (on your high res inkjet printer) and you have paper parts that you cut out and glue to stiff card. Assemble them with glue and you have your building. Cost? Average $8.50 per building. Add more detailing if you want to make it more realistic, e.g. window and door frames or film plastic windows. Then today, I walked past a shop at Clarkson that I’ve walked past and ignored many times before. Then I realised it’s a craft shop. I went in, and they sell all the modelling things I need! Sheets of heavy card, balsa wood, modelling clay in many different colours, paints, cutters, lengths of wire of all kinds, and so on. I don’t need them yet, but there they are, only 5Km away. Nice. I bought another 9 CDs today to add to the 12 I bought last week. Huh? Well, when they are 3 for $10, it’s pretty good value. These are classical music, all the back catalogues of Decca, DGG, Philips, Archiv and Lyre Bird. They are 70s and ’80s recordings, but that’s OK. I already have the music of some of them, but not these specific recordings. One on offer today was a boxed set of Handel’s works for the same price – 3 for $10, with this entire 10 disc box being counted as one disc! I didn’t buy it today, but I’ll probably go back and get it. One good thing about having tastes like mine (classical recordings and obscure books and DVDs) is that things tend to be there when I go back. Obscure things?The local newsagent just down the street keeps a semi-monthly magazine for me, BBC Music. It comes with a CD of classical music on the front, all for $16.95. She only sells one copy each month in this area, one to me and maybe one more. Now that the pressure is off, I’ve thought that the time may be ripe to make a start on my decades-long delayed model railway plan. Above is a magazine layout from about five years ago that I particularly like. It’s in British OO scale (4mm – 1ft). 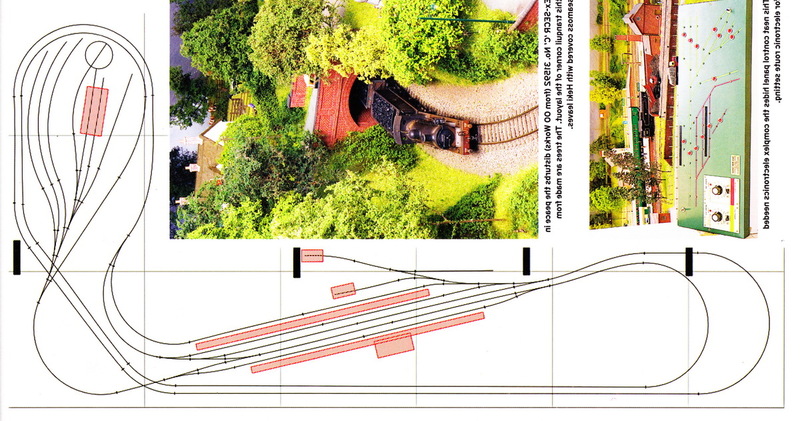 I’m redrawing it in N gauge (2mm – 1ft), and as I have more space available, I’m extending it in both directions. 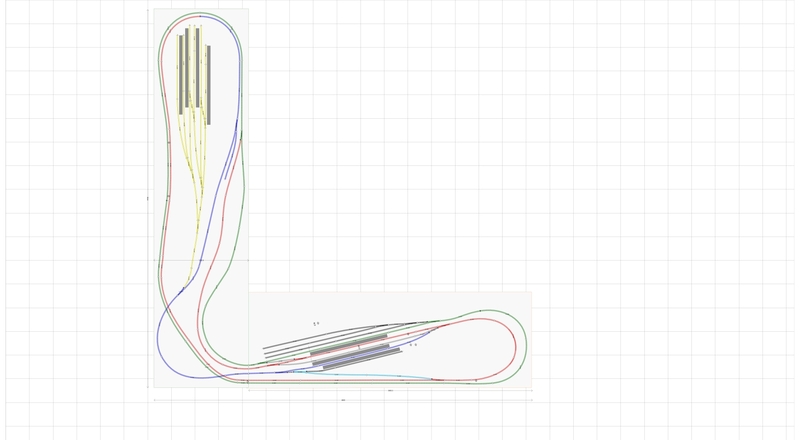 This is the unfinished result of about a week’s work in a CAD program called AnyRail. It’s a bloody marvellous piece of software from Holland. 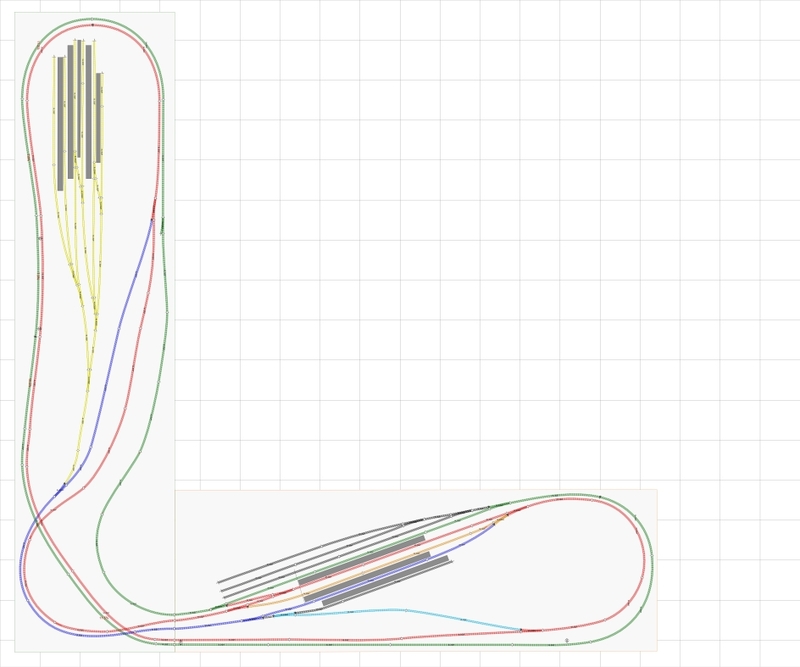 It has complete libraries of all the track pieces available from any given maker, in this case Peco. You just drag a piece (eg a 914mm long straight of flexible track) onto the drawing and bend it any way you want to form the shapes shown above. Place the points (turnouts) and you’ve got your switch yards. It took a bit of learning how to use it, but I’m impressed and pleased for my $57. Each leg of the L shaped baseboard is 2x 1200x 2400 = 4800mm long. I’ll be using standard 1200x2400mm sheets of ply, so each section will be separable for carrying or storage. 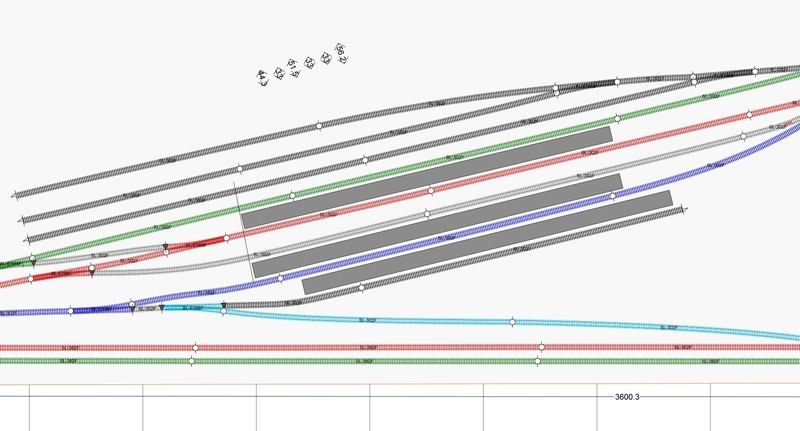 Although cutting across all that trackwork above will be very very difficult. Impossible, in fact, so I’ll have to make each baseboard as light as possible. Then each locomotive is about $100, and carriages are an average of say, $20 ea., so a five carriage train is $200. Just one train! It would not be unreasonable to have five trains. Then the controller/power supply is about $600. Even a basic layout is going to cost a minimum of $2,000. This will be at least a two year project. And where am I going to put it? At first I thought – garage. But, dust and dirt! No, I think I’m going to put it in the lounge room. No women around here to put up their silly objections. No worries. I’m reading John Cleese’s new autobiography, “So, anyway …”. Good book. Almost can’t put it down. He’s just married Connie Booth, who’s an American he met in NY – I didn’t realise. Just reaching the beginnings of the Python era. He wrote a book years ago called Families and How to Survive Them. I didn’t realise that he had a bad relationship with his mother, which blighted his life. I know the feeling. I used to have a family, but they’re not around any more. I didn’t just survive them, I rose above their level. They’re all dead and gone now as far as I’m concerned. They were very poor quality people, so good riddance. Not to be trusted, liars, cheats, double-crossers. I also have a surviving nephew and niece, but even though they know I’ve had health problems and they know where I live, I haven’t heard a word from them in over two years. So much for being their uncle. Very, very disappointing. I thought better of them, but they’ve been infected by their toxic mother. I’ve been told by a doctor that I need to get my blood sugar readings down further (avg. 10 at the moment), and to do it by cutting carbohydrates and building up on protein. I admit, I’m addicted to carbs, and if I can do this, it’ll be a good move. It fits with the CSIRO Total Wellbeing Diet of a few years ago. If I stick to it, I seem to lose about 1Kg/week. The trouble is sticking to it. Bread is everywhere. I’ve stopped buying bread (mostly), but it still appears on any restaurant meal I have. It’s not easy, but then again, it’s not too hard either. Press on. I’ve also stopped the beer! For some reason, perhaps due to some medication I’m taking, it just doesn’t taste good any more. I have one (large) glass of wine a night and that’s all. But considering that I used to drink four stubbies a night, plus nibbles, and half a bottle of wine, and that’s virtually all stopped, how is it that more weight isn’t disappearing? Very discouraging. As the cardiologist told me years ago. “If you go onto insulin, you’ll never be able to lose weight.” I think he’s right. Look at that! It was Saturday afternoon, about 4pm on 10 January. 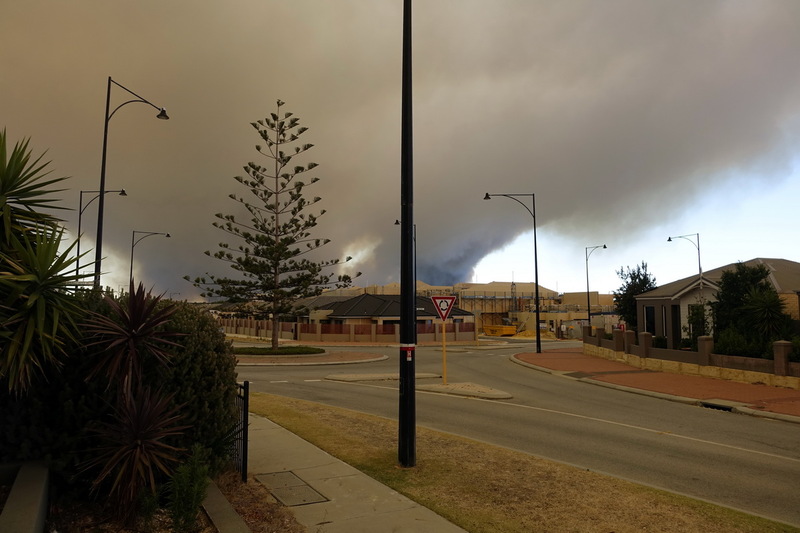 A huge bushfire was out of control about 10Km away but heading straight for us, blown by easterly winds. The house was as dark as in a winter storm. 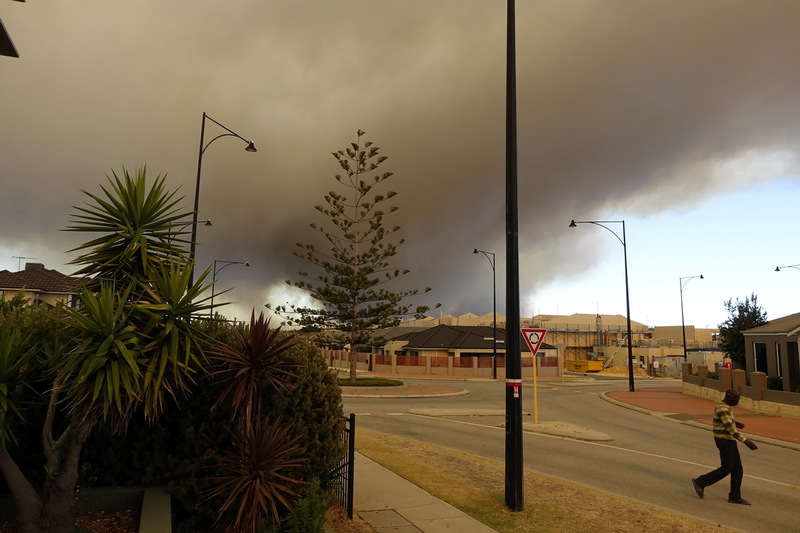 I thought it best to evacuate, following the advice of the Dept of Fire and Emergency Services, so I arranged to stay overnight with friends (I still have one or two who haven’t deserted me) in Scarborough. There was probably no danger, as proved to be the case next day, but I wouldn’t have felt comfortable going to sleep with that heading toward me. Next morning, Sunday, I drove north again and although the fire was still going, there was no smoke visible from my area. Dammit. My legs were going really, really well for skin breaks and ulceration. I was congratulating myself at how smooth and normal they were looking due to daily applications of Dermeze. But on Sunday morning there’s a big ugly break on the back of my lower left leg. Damn. It seemed to happen overnight between Saturday and Sunday, for no reason that I know of. So now it’s back to bandaging and antibiotic. Grrr. I’ve just finished the book Hack Attack, by Nick Davies, the story of the Murdoch London papers and how they hacked anyone’s phone to get what they wanted. And if they didn’t find anything, then they just made it up, invented stories. This is the mob who hacked Milly Dowler’s phone and got hauled before the Leveson Inquiry. What the book shows is that what we read and heard here was just a fraction of what was going on. They just blatantly broke the law for years, aided by corrupt London police (how disappointing) and a totally complacent and incompetent top management at Scotland Yard. Even the commissioners and deputy commissioners turned a blind eye and lied about their lack of action. It was all down to fear of Rupert Murdoch. He dictated to everyone, even prime ministers (Blair and Cameron). He set British Government policy because he would “monster” anyone who dared to cross him, that is, his papers would start a campaign of any scandal they could find, and make up lies about what they couldn’t find, to ruin the life of anyone who dared to oppose the. Suicides resulted! Politicians and prominent people lived in fear of being monstered by Murdoch’s papers. he protested that he didn’t know what was going on. Of course he did! The depressing thing is that they were humbled and put in their place for a while (the News of the World was closed down), but now the fear of the Murdoch press is back where it was, both in Britain and here. That man has a malign influence way beyond his position. An unelected person, he is applying subtle and not-so-subtle pressure on governments to get his way. His latest comment blaming all Muslims for terrorism is typical. The man is an out and out racist. But so is our government, so they’re a good match. 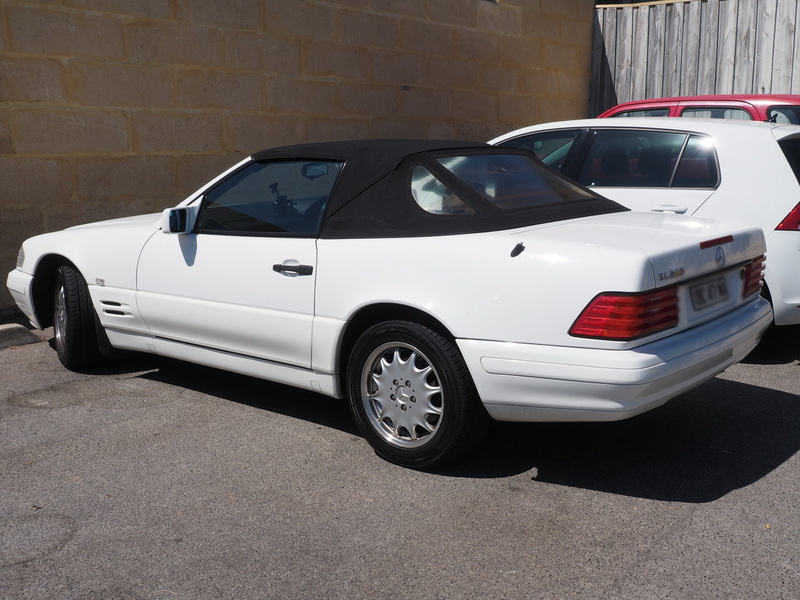 Mercedes 500SL. Phwoar! Around $22K. There are three for sale on the web at the moment. I want one! So another year has passed. It’ll be two years on 3 April that I’ve been in this house – the time just seems to slip by. I’m pretty happy here now, no more homesickness for the Trigg house. Well, not quite true. I drove past it this morning on Marmion Avenue and I must admit a wave of nostalgia came over me as I thought of all the good times I had there. But then I think of the traumatic time from June 2012 to April 2013, one of the worst periods of my life. Ugh. So many stress things. I have to stop myself from recalling events of that time. PTSD. 2014 is marked for me by not being in hospital all year! No more heart problems and my legs are pretty smooth and clear now. Dermeze. Recommend it. 2014 was also marked by doing those two ship cruises. On the Arcadia from Fremantle to Singapore via Bali in March, then the big Asia cruise on the Sapphire Princess from Singapore to Beijing in October and November. Although I’m glad I did these trips, no more cruising for me. I can’t stand the crowds and the queueing. And you have to realise, the ship only takes you to the port. If they say they go to Bangkok, they actually don’t. They go to the port for Bangkok and it costs you A$190 or so and a two hour bus trip each way to visit the city. Same for Saigon and the other cities, although Nagasaki was pretty close in. Nah, too much hassle and too expensive for me. Learnt my lesson. I would consider cruising to get from Fremantle to London, for example, but $9,000 when you can fly for $1,500 or less, return? No way. It was the year of the Northam Senior High School 50th Anniversary Reunion. That dominated my life. It started slowly, just sending out mass emailed newsletters and maintaining our database of former students. We already had about 125 from previous reunions but new names just kept coming, until the final tally was about 175. I had no idea there were so many. I didn’t know a lot of them as being at the Hut, we tended to be a bit isolated. It was easy in the first part of the year, but as it built towards 11 October, I found myself working longer and longer on the magazine. I’m quite a perfectionist and I wanted it to be pretty whizzo, so I wrote a hell of a lot for it, which took a fair amount of time. Then I had to take the other students’ short biographies and format them for the magazine pages. Not difficult, but time consuming. I was pretty happy that I managed to get 49 bios at the end. But the latecomers! Seven people submitted theirs on the very last day. What did they think happens, that their bio just magically appears on the page, instantly? That last day, and the last weekend, was very, very stressful, I can tell you, not helped by a hard drive failure (an SSD). Two days’ work had to be redone. I was lucky I had a backup to that point, at least. The magazine was a triumph, I feel. Several people have said how much they enjoyed reading it (it was 450 pages!). I wrote a hell of a lot of it – 22 pages on life as a Hut Lad; another 25 pages on Life at School; half a dozen pages of Hits of the Sixties lists; four pages of “I Remembers”; three poems, and so on. But do you think I could get anyone else to write anything? No way, (with one small exception). Despite my appeals for material, I got nothing. Likewise, I’m mystified by the lack of feedback on what I wrote. Not one person has said anything about the Hostel and Life at School articles. Didn’t anyone have anything to add or change or talk about? It seems not. I suggested things for people to write about but I got nothing. Oh well. Too late now. I doubt there’ll be another magazine after that effort for such little reward. Nonetheless, people did seem to appreciate the reunion. It was quite a significant event. I only wish I hadn’t been so exhausted on the day. My shop tribulations go on and on. On Xmas eve I bought some garlic prawns on skewers from Coles. They were in plastic packs and there was a prominent yellow price label, $1. Naiively, I thought this was per pack so I bought the last two packs.When I got home, I found I’d been charged $12 for them. They were $1 per skewer, not per pack. Oh well, my mistake I should have read the price more closely.But that meant there should have been six per pack, but there were only five! I had to count carefully to be sure, but that was it, alright. So I have to go back and complain. Then I bought some beer at IGA and didn’t check my till receipt until I got home. More fool me – I’d been charged twice for one $16.99 six pack. I complained yesterday and only got the refund for one pack. So much, again, for the Scanning Code of Practice. On Tuesday I bought some Coles Mixed Nuts. As soon as I opened the packet last night (New Year’s Eve, remember?) there was an immediate whiff of staleness. I looked at the Use By date – 10 June 2014! Six months out of date. So that was the end of my NYE treat. Grrrrrrrr! I’ll be taking them back today; they still smell stale enough to be inedible. If I’d been having guests, I would have been embarrassed. It’s lucky I’m so vigilant. I’ve learnt over and over to always check the docket! Notice that all these errors are in the merchants’ favour. It’s always the customer who loses. Nice trick! In October, there was an announcement by Lockheed Martin, the giant US defence firm, that they have found a way to make fusion power in a device the size of a ship container, able to fit on a truck or into an aircraft. This is hugely important. It has the potential to completely change the way we generate electricity. No more oil needed, no more coal, no more greenhouse gases, no more CO2. Massive news. Lockheed Martin are a big, extremely capable and scientifically reputable company. They would hardly announce this if there was any doubt that they can do it. Within five years for prototypes and within 10 years for production models. (I have no doubt they’ll be able to get the size down and power up in the next decade, as well). Yet to hear the Liberal Government in Canberra talk, it’s as if they don’t know anything about this new development. 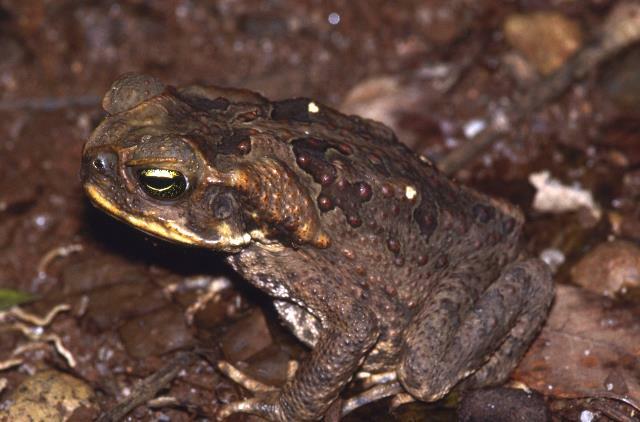 The Rabbott continues to talk up coal mining as if it’s the power source of the future. He seems to know nothing of its marginal cost equation or its CO2 emissions problem. He either doesn’t know about fusion power, or can’t understand it, or doesn’t care. As well, photovoltaic panels are now up to 40% efficiency, their cost has fallen 80% or so, and storage battery technology is now ready to take over in the household. That means falling demand for mains electricity and hence coal fired power stations. But the Rabbott keeps pushing fo new coal fired power as if none of these developments is happening. The man’s an idiot.